When you map a directory to an application, you can also define the application's ability to add/update/delete users and groups in the directory. To do this, use the 'Permissions' tab in the 'View Application' screen. For details on directory-level permissions, refer to the instructions on specifying directory permissions. Below are instructions on setting the application-level directory permissions. Allows the application to add groups to the selected directory. Allows the application to add users to the selected directory. Allows the application to modify groups in the selected directory. Allows the application to modify users in the selected directory. Allows the application to delete groups from the selected directory. Allows the application to delete users from the selected directory. 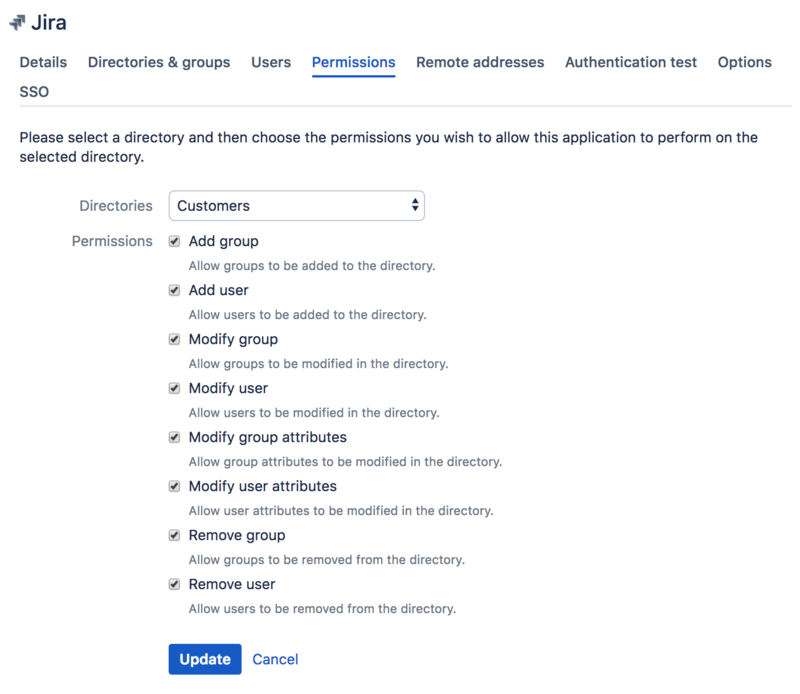 When you initially map a directory to an application, all of the application's permissions are enabled by default. But note that disabling a directory-level permission will override any permissions enabled at application level. Click the application you want to edit. This displaya a list of directories that are currently mapped to the application, and a set of permission check-boxes. From the drop-down list, select a directory. Select permissions you wish to allow this application to perform on the selected directory. On the application permissions screen, the words '(disabled globally)' will appear next to any permission that is disabled at directory level.